Artists are testing the limits of Kato clay. 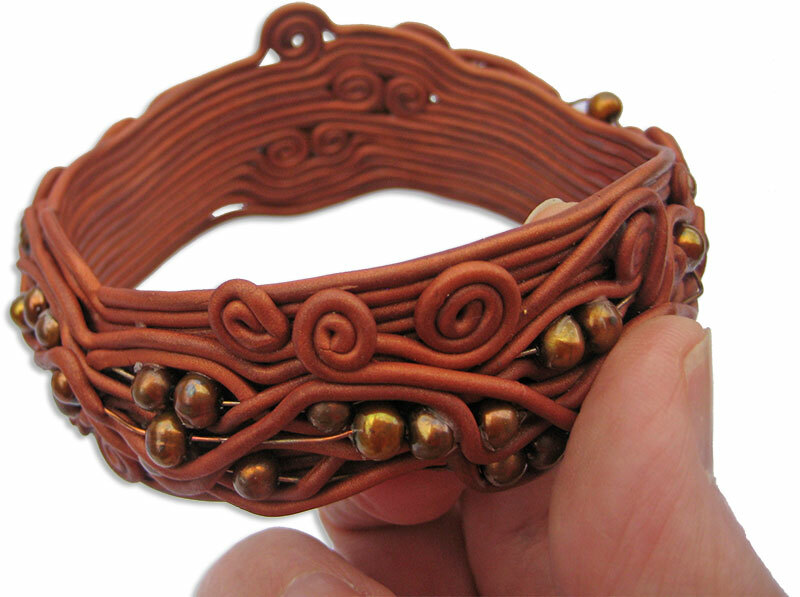 This bangle from Laurie Prophater is constructed of thin strings of copper colored Kato that have been wound decoratively around a pop can and embellished with pearls on wire. I was surprised at its strength…and beauty. Laurie links to design sites on her blog. If you want to see her personal work, you’ll have to go to her Flickr pix. Rebecca Watkins built a strong faux wood prototype bangle out of intertwined extruded triangular strings of Kato. She brushed it with dark metallic powder and sanded off the excess. Her minimalist approach is very appealing. I can’t believe I’m uploading to the blog mid-air on my flight home from Denver. Southwest offers wifi for $5! By creating an in-flight post I can avoid testing the limits of my marriage by heading straight for the computer when I get home. I’ve had a lot of problems with thin Kato bangles which lead to me doing a lot of ‘make do’ scientific testing. I think I have solved it now, have yet to break another bangle. Love the look of ArtyBecca’s bangle. Glad you can use your flight time constructively! I have not tried a bangle without some type of substructure, but am now interested in experimenting. Both bangles are inspiring and I really enjoy both their blogs! I agree with Cara Jane….airborne creativity! Loved your Nana’s bangles and your story. I am sheicarng high and low for the Tiffany’s gold bangle watch that I owned for 25 years. The entire works fell out and all I have is the band. It has huge sentimental value to me and Tiffany’s was unable to help me find a way to replace the works. Do you know if Nana’s bangle watch might be the one I’m talking about? It looks like it in the photo. If so, do you have any idea where I might find another one or what the model number of it is. The whole back fell off mine when the works fell out so I have no way to find one. I search relentlessly to no avail. I hope my grandchildren will appreciate my Tiffanys bangles and hopefully the bangle watch too if I get it back together the same way you appreciate yours! Lovely example of Kato Polyclay pieces from talented artists. Thank you for sharing. And one more reason to love Southwest Airlines–they help us get our PCD fix! Wow 2 of my personal favorite, most inspiring ARTISTs both on the same day !!! Its always a treat to see your new items. I must be getting old Laurie. I drooled all over your picture, went to your blog and then ran to your flickr site yesterday and neglected to leave a comment about your wonderful work….sigh. Congrats on another beautiful piece! To the comments concerning the strength of polymer bangles…I’ve worn this bangle for approximately 4 months. I have been amazed by its resilience to the typical abuse that bracelets endure. (I am surprised that the loop on the outside edge has survived) The bangle was made with..original Kato. I am not sure about the durability of the new formulation.